The lessons we’re taught in childhood often stick with us throughout our lifetime. Some of what’s picked up along the way helps us to live happy, value-based lives. However some lessons hinder our potential or otherwise cause us inadvertent harm. In the context of nutrition, there are a few cultural concepts that I feel are problematic. The first is the notion that each meal needs to include a starchy component, whether bread, potatoes, rice, etc. The second is the idea that most meals should end with a dessert or something sweet. I come from an Italian background. Spaghetti and meatballs was a staple in the household that I grew up in. I enjoyed the taste immensely and I naturally assumed that it was a healthy food to eat. After all, my mom always used lean meat and cooked the meatballs in extra virgin olive oil. She prepared homemade tomato sauce and selected good quality semolina pasta. What could be wrong with that? Knowing what I know now, I would answer that question by saying, “the pasta”. In my opinion, refined flour is an enemy of good health. The question then becomes, what can you use as a replacement for pasta in a spaghetti and meatball dish? This may seem quite unconventional but I think wilted spinach is a great alternative. Spinach is an extremely nutritious vegetable that accompanies many Italian style dishes very well. It also provides wonderful visual appeal. Imagine this: several meatballs with Marinara sauce lying on a bed of vibrant, green spinach. But beyond that, this combination is also lower in calories & carbohydrates and richer in antioxidants and nutrients. * Based on a serving of 10 golf ball-sized meatballs. I used a cookie scoop to measure the approximate size. Directions for the Turkey Meatballs - Begin by sauteing a chopped onion in a small pan with olive oil over medium heat. Once the onions become translucent, transfer them to a bowl. Toast three 1/4 inch slices of Purity Bread until slightly brown and crispy. Tear the toasted bread into small pieces and place in a food processor. Pulse the bread until finely ground into crumbs. Pour the crumbs and the remainder of the ingredients into a mixing bowl, combine thoroughly and form into meatballs. Heat a large fry pan with olive oil on medium heat. Add the meatballs making sure not to crowd the pan by adding too many at a time. Brown all sides of the turkey and transfer to a plate to cool. Drain the pan, turn the heat to low and then add some sugar-free Marinara sauce. Re-introduce the meatballs to the pan and sauce, simmer until warmed through. Directions for the Wilted Spinach - Saute fresh, minced garlic in a pan over low-medium with olive oil. Allow the garlic to break down a bit and mellow for a few minutes before you gradually add in the freshly washed (and dried) spinach. Toss the spinach regularly to ensure uniform cooking and flavor. 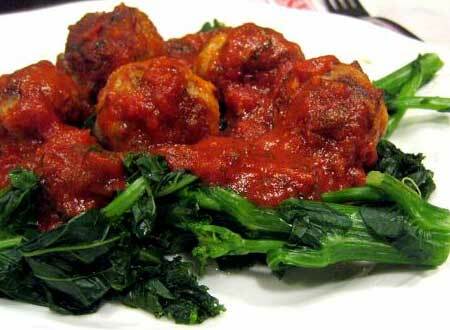 Once the spinach seems cooked through and tender, serve and top with several meatballs and Marinara sauce to taste. If the leap from pasta to spinach is too drastic, consider using another low carb alternative to pasta: spaghetti squash! It’s very easy to make: 1) preheat your oven to 400 degrees; 2) cut the squash in half length-wise; 3) drizzle olive oil on the cut sides and season with salt and pepper; 4) place the squash, cut sides up on a baking sheet; 5) bake until tender – about 60 to 75 minutes; 6) allow the cooked squash to cool a bit then scrape out the flesh, using a fork to make spaghetti like strands. Changing long held dietary patterns is a process that requires practice and repetition. It’s really a matter of altering your perception of what is expected and “normal”. In my experience, the key is to convince yourself that your food choices need to reflect your overall goals. Chief among those goals should be a desire to lead a healthier life. It is that endeavor which will then support every other objective that you have with respect to your career, your family, friends and beyond. Love the spinach and spaghetti squash, JP! Years ago, when I was a vegan, I fell. I just fell down! But I broke my arm. PLUS, it took 16 weeks to get fully recovered. I’m much more resilient now, even though I’m 15 years older! Must be the LoCarb Thinking! Thanks for sharing that recipe. Looks so delicious and yummy. More Italian inspired LC recipes will be forthcoming! I’m very happy to know that you’re healing quickly/well. Keep up the good work! I love spinach and squash as well. I suspect you’re stronger in many ways now. It’s great to see your growth and success re: your diet and beyond. That is to bake the meatballs in the oven in olive oil…They taste exactly the same, if you are cooking for many people you can fit more in a baking pan…They are delicious! Thanks for the tip, Cyndi. I love healthy and practical suggestions that make kitchen time more efficient. Much appreciated.